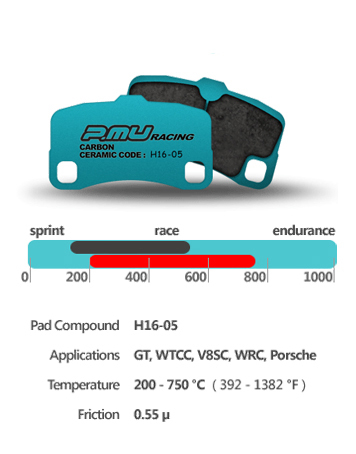 P.Mu H16-05 is the ideal rear pad, in combination with P.Mu H16-03 in the front. H16-05 is a ‘competition-only‘ pad designed to offer the very best performance in torque, feel, fade resistance and release. H16-05 won’t start to show signs of fade until around 800+°c which is well above what brake systems are designed to cope with in general. Good initial ‘bite’ coupled with very good release characteristics means the driver can attack the braking area with little concern for locking rear wheels. Perfectly suited to applications such as Porsche GT3 rear (with H16-03 front) where the behavior of the rear pad should match the front, but with less initial bite and less initial friction.